Stop by and see some awesome local art from all local artists! Check out the Art Student's League of Denver's cool historical building, their class offerings, and enjoy the best art fair in Denver! If a painting isn't listed for sale on this site, please feel free to email me about it's availability. If you haven't yet discovered the joys of shopping on Etsy, you are just a click away! Etsy is a place to buy art, jewelry, clothing, soaps, etc that are all handmade by people around the world. I've found great gifts (and spent countless hours) going through all the many things available to buy on this website. My first purchase on this site was a little scrabble pendant similar to this one. Keep this website in mind when shopping for Christmas and birthdays (or just looking to treat yourself to something nice). The changing of the seasons. Goodbye summer, hello winter! Breathless. What more is there to say? I hope some day everyone can see this landscape for themselves. ASLD Summer Art Mart Success! 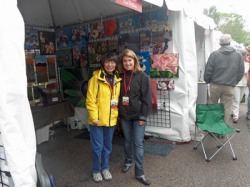 Robin and her booth partner Xue. 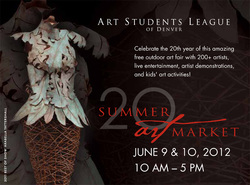 Many thanks to everyone who can out and supported me at the 2010 ASLD Summer Art Mart on June 12th & 13th. Not only was it a rainy weekend, but very cold too! My first art mart was still a huge success and I can't wait until next year! A special thanks to those who purchased my original art! I recently added myself to the FineArtAmerica website. This is a great website to buy affordable prints, greeting cards, or original art. Please check out my art for sale, as well as thousands of other talented artists across the US! June 2010, Morgage West Gallery; S. Pearl St, Denver, CO. First Friday Art walk showing.